For those in Montreal, hop on a free bus to the Ottawa rally! Returning to Montreal in the late afternoon or early evening. TO BOOK A SPOT, email barrierelakesolidarity@gmail.com with your name and phone number. What if a foreign regime was destroying your system of government, so it could then steal your resources and prevent you from environmentally protecting your homeland? This is what the Harper Government and federal bureaucrats are doing to the First Nation of Barriere Lake. For more than two decades, the Algonquins of Barriere Lake have been demonstrating environmental leadership to the rest of Canada, campaigning to stop destructive clear-cut logging and to implement a sustainable development plan in their homeland in north-western Quebec. But multi-national forestry corporations and government bureaucrats have refused to honour any of the agreements signed with Barriere Lake. They have tried at every turn to undermine the small community, one of the poorest in the country, and prevent them from implementing and realizing their vision for the protection and stewardship of the forests. The David-vs-Goliath story now has a dark new twist: the Conservative government and bureaucrats in Indian and Northern Affairs Canada are interfering in Barriere Lake’s internal affairs, using section 74 of the Indian Act to forcibly assimilate and destroy the community's traditional government -- a traditional government the community has used for countless generations and which maintains their hunting way of life and respect for the environment. Led by Barriere Lake youth, the overwhelming majority of the community are struggling to preserve their traditional government, so they can continue protecting the watersheds, forests, wildlife and lands for all future generations, Native and non-Native. 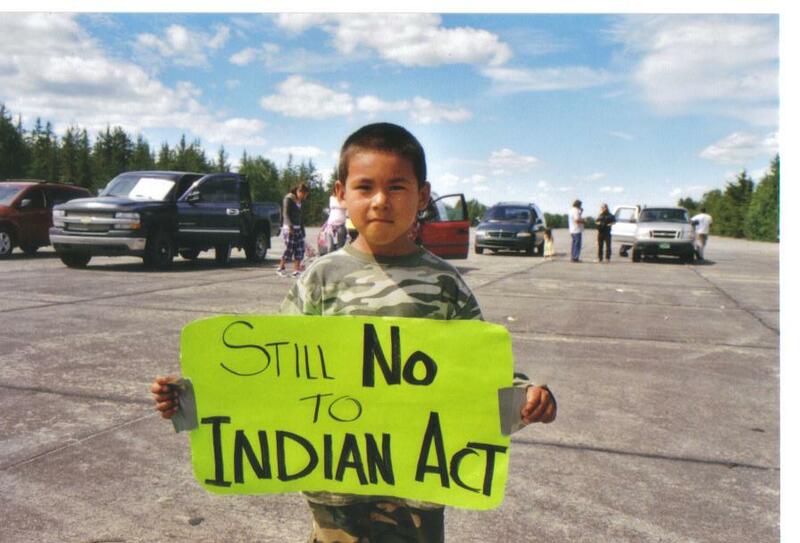 The Harper government is violating the Canadian Constitution, which protects the Aboriginal right to self-government. They are violating the United Nations Declaration on the Rights of Indigenous peoples, even though they have now endorsed it. Join the Algonquins of Barriere Lake on Parliament Hill as they demand the Harper government and federal bureaucrats reject the use of section 74 and respect the community's traditional government and vision for environmental protection! The government has used an archaic section of the Indian Act – section 74 – to unilaterally impose a different system of government on Barriere Lake. Barriere Lake’s traditional government – open to community members who have connection to the land, and in which Elders guide potential leaders and safeguard their customs – ensures that community members maintain their sacred bond to the land and their hunting way of life. The band council electoral system the Harper government has imposed destroys the sacred governance bond the community has with the land. By breaking Barriere Lake's connection to the land, the Canadian and Quebec governments hope to get away with violating trailblazing environmental agreements and with illegally clear-cutting in Barriere Lake's traditional territory. The overwhelming majority of community members want to protect their traditional governance system, but the bureaucrats in Indian and Northern Affairs Canada are spreading the misinformation that they are only a small group. Through the summer, the Indian and Northern Affairs Canada bureaucracy ran an illegal process, imposed by the Quebec police, to bring the new system into the community. Fewer than a dozen ballots were sent in to nominate candidates for an Indian Act Chief and Council, who where then seated by acclamation. Meanwhile, almost 200 community members had signed a resolution rejecting this process! That represents a majority of community members who are eligible to participate in their political process. Even the acclaimed Chief resigned in protest, refusing to break ranks with the community's majority. But four rogue band councillors with no community support have been illegally making decisions on behalf of Barriere Lake ever since. Shuttled to secret meetings with forestry companies and government officials, these councilors are being usined by the government to derail Barriere Lake's precedent-setting environmental agreements and to facilitate illegal clear-cut logging. Youth in the community are leading the movement to protect their traditional government and to heal and overcome the community divisions created by the internal meddling of government bureaucrats. They are demanding the Harper Government cancel the imposition on Barriere Lake of the section 74 Indian Act band council system and respect their right to select leaders according to their traditional system of government.